The road from Mannum to Walker Flat is a classic Australian drive. 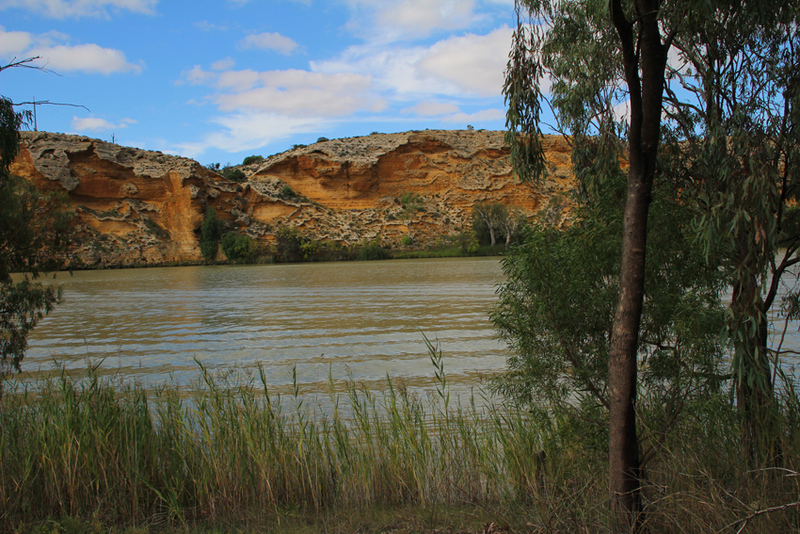 With low hills to the left and the river on the right it winds past limestone cliffs and mallee scrub. It is a short drive of no more than 30 kms but there is ample opportunity to get out of the car and wander around in the scrub or capture a panoramic shot of the river. The countryside is typical of the Murray Mallee zone. Mallee are smallish eucalypts that have numerous trunks growing from the same base. They are of uniform height and stretch for kilometres in an unbroken forest. The hills are predominantly limestone based and where the river cuts through them it exposes a wonderful array of fossils. As you come down the hill into Walker Flat the river takes a sweeping bend exposing ochre coloured cliffs that rise abruptly from the water. There is small community of shack owners, a general store and places to camp, launch a boat or cross the river on an old fixed line ferry. The area has several billabongs; backwaters fed by floods; and it was these that I had come to explore. 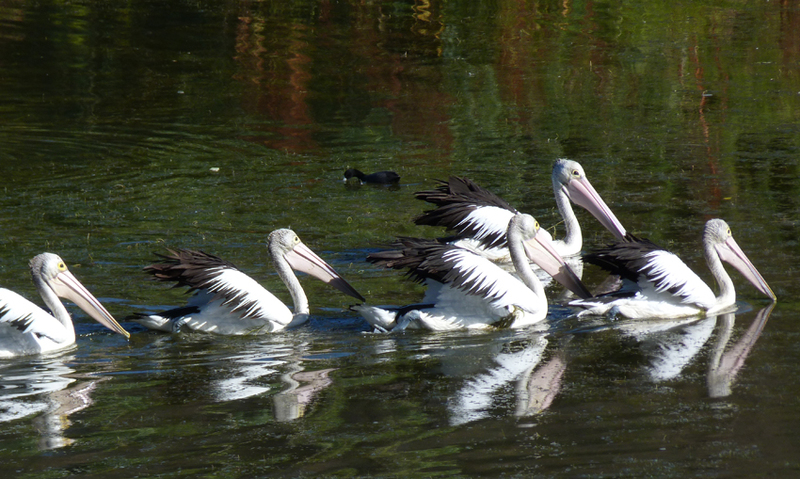 Even as I drove down from the low hills to meet the river I could see a flock of pelicans cruising along the main channel of the river. Camera in hand, I walked along a dirt trail that followed the course of a large billabong that was bordered by thick stands of reeds and some old eucalypts. 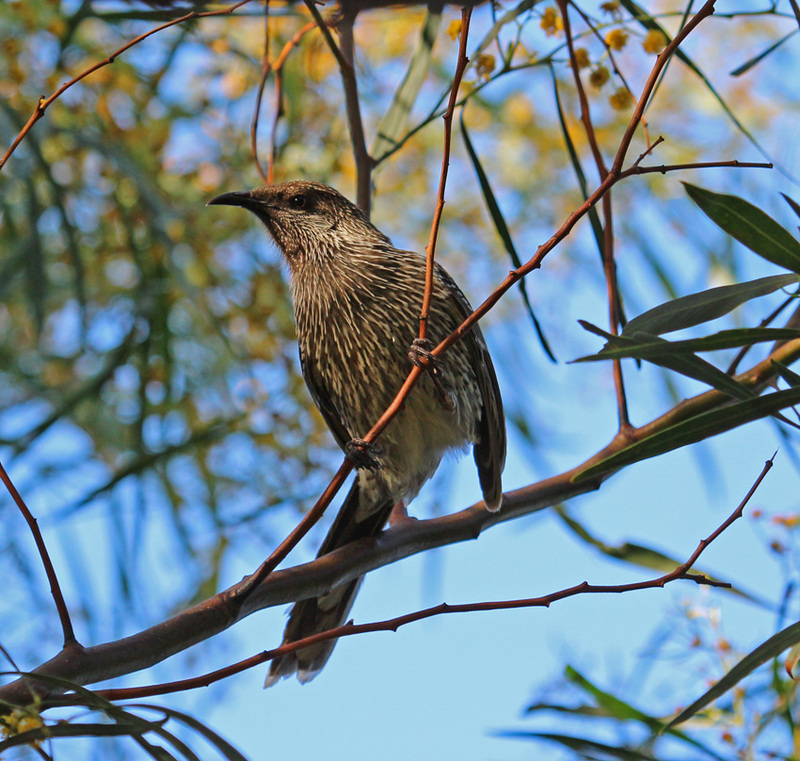 My quick reconnaissance was useful and I located a dozen different bird and insect species in the first few minutes. However, the wildlife seemed very wary and scattered at my approach. Accordingly, I resorted to my favourite strategy for capturing images under these circumstances and found a quiet spot with a clear view in every direction, settled down and waited. Within twenty minutes or so the rhythm of the river bank seemed to return to normal. So long as I didn’t make any sudden movements or sounds most of the wildlife seemed to view me as a part of the environment and I, in turn, started to notice the hidden things that were going on all round me. 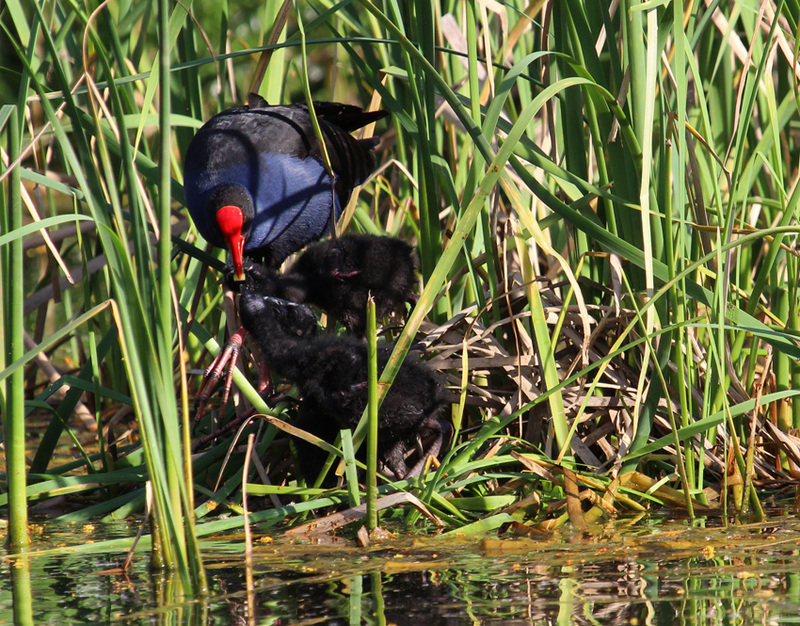 Twenty metres in front of me the reeds began to move and a purple swamp hen emerged delicately grasping the plants with his outrageously huge feet. I eased the big lens up slowly for a better look and to my surprise the adult was accompanied by two fluffy, black chicks. Over the next few minutes I was privileged to watch the adult cutting up reed stalks with its powerful beak and feeding them to the young. 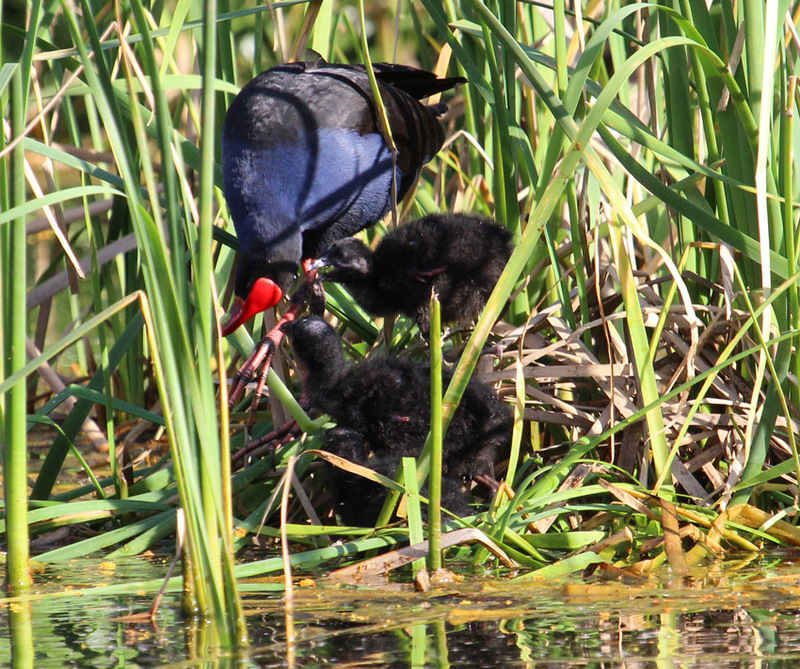 Later, another swamp hen appeared and took the chicks further into the reeds indicating that both parents were involved in rearing their brood. My next encounter was a tad closer. 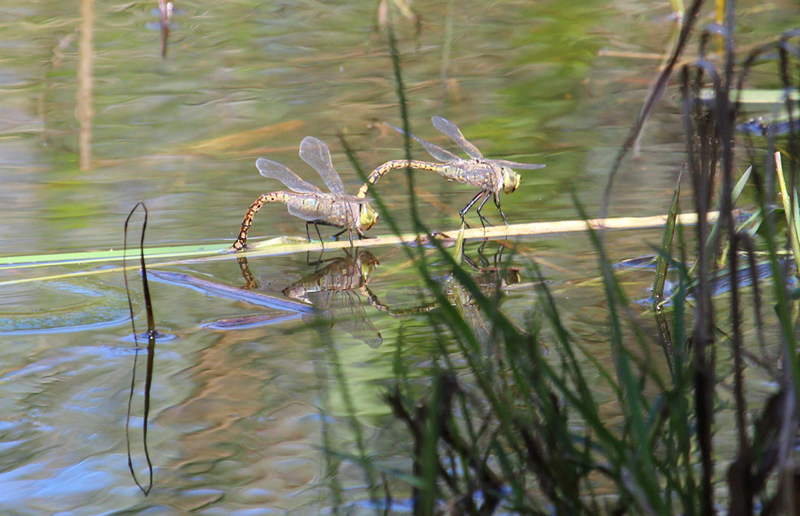 A variety of large dragonflies and their more delicate cousins the damselflies had been continuously flitting across the water just a few metres away. 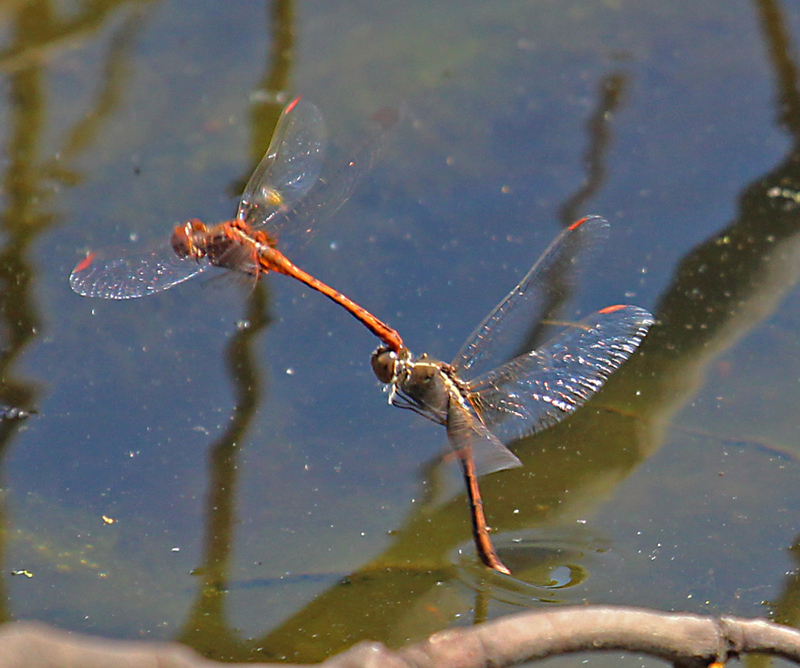 They appeared to be in a mating phase with an occasional pair joined head to tail, which is part of the reproductive process. Others were obviously hunting smaller insects while a few seemed to be establishing some kind of territory by chasing off rivals of the same species. Between the dragonflies and purple swamp hens feeding their family my patience seemed to have paid off and re-confirmed an old but well tried approach to wildlife photography. Better to let the target come to you than chase it.